Psalm 97 is consistent with the concept of divine glory in the Hebrew Bible. God is invisible, but evidence of divine mighty acts is visible. YHWH is an active player on the stage of human history. Moses, interceding on behalf of the Israelites between the infamous Golden Calf (Golden Bull, really) incident (Exodus 32) and the restoration of the covenant (Exodus 34), asked not only to know what God wanted him to do but to see God’s Presence, or, as some versions translate the Hebrew word, glory (33:18). God consented to the first request and to a partial view of the divine Presence/glory, for a full view would be fatal to humans. The connection to Exodus 32 was that the Golden Calf/Bull was, for those who adored it, a physical stand-in for God, who became angry yet held back from destroying such a stiff-necked people (33:3). In the Gospel of John Jesus was the physical embodiment of divine Presence/glory, which was evident in his deeds as well as in his resurrection. Even though Moses had a close relationship with God, Jesus was more intimate with YHWH. And many people saw, met, and interacted with Jesus. They saw God, but many of them did realize that. You must not do that! I am a fellow servant with you and your comrades the prophets, and with those who keep the words of this book. Among the themes in the Gospel of John is that Jesus, the physical embodiment of the divine Presence/glory, came into the world and encountered much rejection. Many people preferred an inadequate glory instead. Many people still do. How many of them know this about themselves? and you embrace us all with your mercy. whose sin has been remitted. as by the drought of summer. and did not hide my guilt from you. Then you forgave my sinful guilt. Acknowledging one’s sins is pat of the process of repentance, or turning away from them. The key word in the assigned reading from Luke 15 is repentance. Jesus answers criticisms for welcoming and dining with sinners by telling parables of being lost then found and welcomed. Sheep were essential to the livelihood of shepherds in verses 3-6, just as the small amount of money in verses 8 and 9 probably constituted the woman’s entire savings. In each case a penitent sinner is as precious to God as the lost sheep is to the shepherd and the ten silver coins are to the woman. Heavenly celebration ensues after the return of the newly penitent. This theme continues in verses 11-32, traditionally the Parable of the Prodigal Son, although the loving father and the dutiful yet resentful older brother are equally compelling characters. I detect a difference in the portrayal of God in Luke 15 and Exodus 32. God seeks the lost in two parables in Luke 15 and waits for the return of the penitent in the third parable. In Exodus 32, however, Moses has to persuade God not to destroy the Israelites. Granted, they probably did not know the error of their ways, but the God of Luke 15 would have responded differently than the God of Exodus 32. The God of Luke 15 would have, like the father in the Parable of the Prodigal Son (for lack of a better name), waited for them to realize their sins then repent. In universe, then, did the ten silver coins know that they were lost? The Prodigal Son came to his senses in time. And the lost sheep was an especially stupid animal. Yet all of these were precious in Luke 15. I acknowledge that both judgment and mercy exist in God. The balance of them is beyond my purview. Yet I rely on divine mercy, which I understand to be vast. That mercy, extended to me, requires much of me. I am, for example, to act mercifully toward others and to respond gratefully to God. Grace is free, not cheap. Principles are easy to state, but coming to understand how best to apply them in daily life is frequently difficult. A well-meaning person might, out of faithfulness and compassion, act in such a way as to make a bad situation worse accidentally. The most effective method of helping might not be obvious to one. What is a person who seeks to apply the Golden Rule properly to do? May you, O reader, find the proper answers in your circumstances. May each of us, precious in the sight of God, remain faithful, repent when we depart from the proper path, and function as the most effective agents of divine mercy possible, by grace. continually seek the face of God. If I were to go in your midst for one moment, I would destroy you. Moses talks God down, fortunately for the Israelites. Faith, for St. Paul the Apostle, was inherently active. Hence the Pauline definition of faith was that, in the absence of proof for or against a proposition, one trusts that it is true and acts accordingly. This contradicts the definition of faith in the Letter of James, whose author wrote that faith (for him merely intellectual) is insufficient for justification with God. No, in the Letter of James justification comes via works. Both writers agreed that works are essential for justification with God, but St. Paul understood works to be part and parcel of faith. These are the kinds of nuances many people overlook in the Bible. The full text of the poem begins on page 180 of this book. The presence of God is tangible indeed. In my darkest hours, my happiest moments, and the times between those two extremes I have encountered God via people and animals as well as directly, without mortals as vehicles of grace. You, O reader, might understand well what I mean because of your experiences. If you do not, are you willing to perceive the tangible presence of God? The theme of this post comes from the collect. May God cleanse us from all evil that arises from within ourselves. This evil manifests itself in many forms, such as greed, exploitation, needless violence, callousness to the lack of necessities, et cetera. The author of the Letter of James encouraged people to endure doubt and temptation. Doubts arise from within, and temptations come from many points of origin. How one deals with temptations points to one’s inner life, however. Today’s example of that principle comes from Exodus 32. 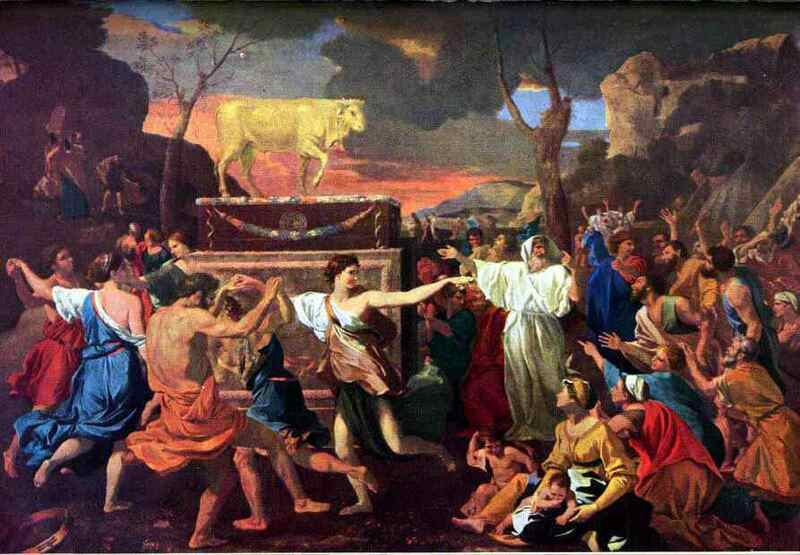 The purpose of the golden calf was to replace Moses, not God. Moses had been away on the mountain so long that many people feared that they had lost their conduit to God. That conduit was Moses. He returned, of course, and was livid because of what he saw, as he should have been. The slave mentality thrived in the recently liberated people. Theology of God has changed from the beginning of Genesis to the end of Revelation, a fact which explains many otherwise confusing purposes and incidents. I admit that reality while I affirm that the full revelation of God is the one we have received via Jesus of Nazareth, God incarnate, fully human and fully divine. Yes, we humans use mortal and immortal intercessors–even in Christianity. I have, for example, asked people I know to pray for me, family members, et cetera. I have even asked Mother Mary to intercede. (And I grew up as a good United Methodist boy!) No, I do not need any intercessor apart from Jesus and the Holy Spirit, but I like the other intercessors also. The Hebrews in Exodus 32 did not need Moses, any other mortal, a golden calf, or anything else to function as a conduit to God for them. They needed no conduit at all. No, they needed to approach God humbly as free people, not as slaves in their minds, murmuring and rebelling often. 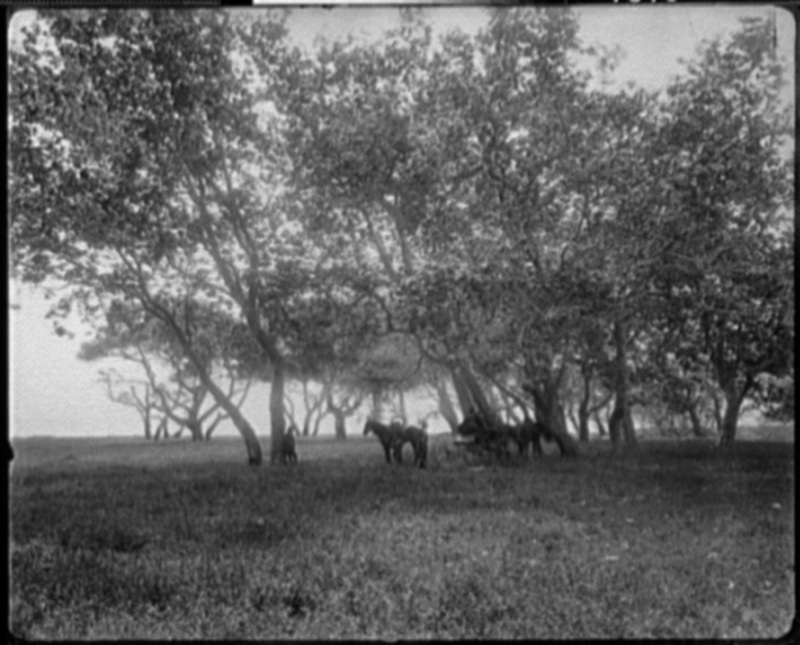 From faithful confidence they would have gained endurance during difficult times. Then they would have resisted temptations more easily.